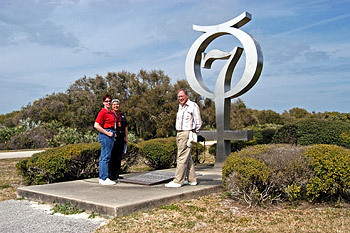 (left) This is the monument to the Mercury 7 astronauts. 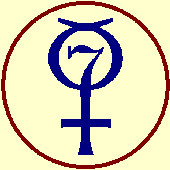 The Arabic number 7 represents the seven original astronauts. 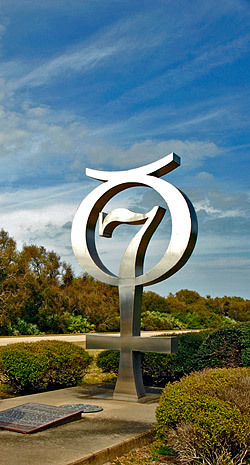 The other figure is the astronomical symbol of the Planet Mercury. 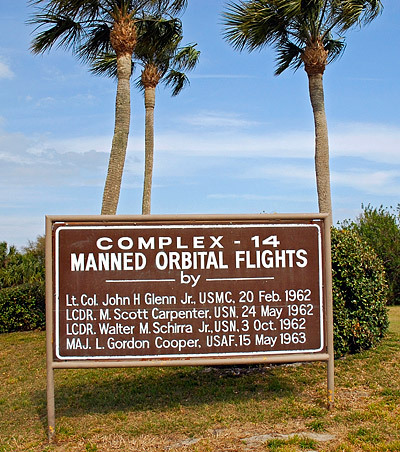 (right) A sign marks pad 14 and the 4 men who launched along with their launch dates. 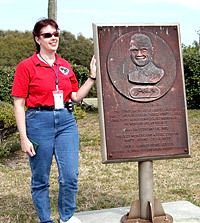 (below) Sue Sitko with the plaque honoring John Glen. (above) This is all that's left of the pad. 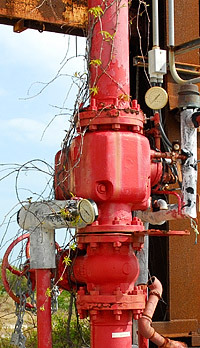 Much has been torn out, since the rust was leeching into the ground water table. 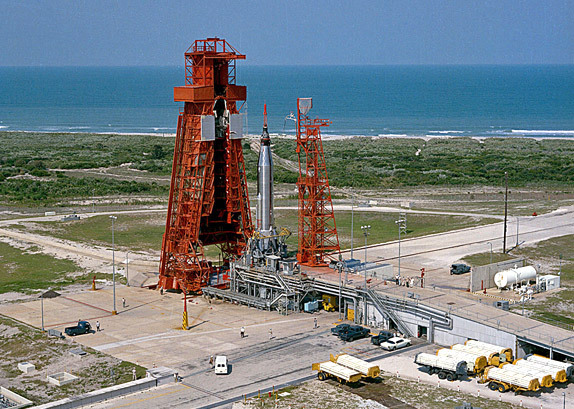 (left) Check out this launch photo about 1963. You can see the Mercury capsule on top, ready to fly, and also clearly see the ramp and support framing that corresponds to the relic above. 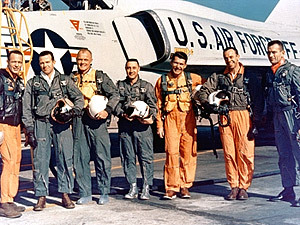 (below) Scott Carpenter, L. Gordon Cooper, Jr., John H. Glenn, Jr., Virgil I. "Gus" Grissom, Walter M. Schirra, Jr., Alan B. Shepard, Jr., and Donald K. "Deke" Slayton. 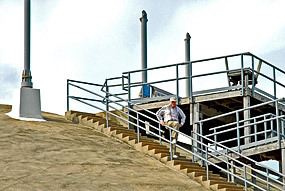 (above left) The "blockhouse" control area is only about 100 yards away from the pad! 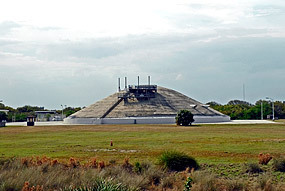 Compare this to the current situation where the blockhouse is 3 miles from the Shuttle launch pads, and the actual control center is 5 miles! (Middle) That's me on the blockhouse. Yes, those are periscopes. The same kind found on older subs. 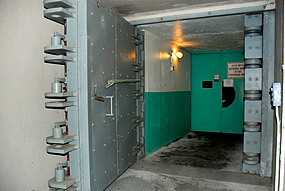 (above right) Check out the size of the blockhouse door. It's bigger than it looks. 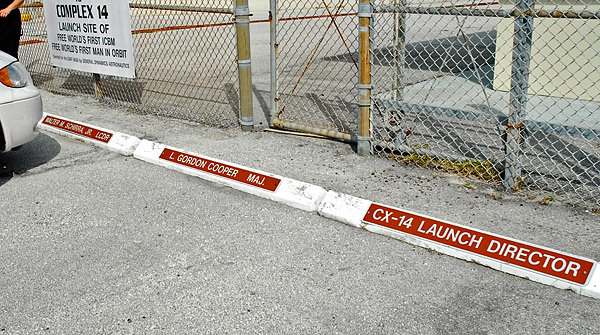 (above left) A very nice touch... they have labelled the parking spaces at this derelict site for the astronauts and their support team. (above right) The weeds take over after all the years of inactivity. (above) This photo 11/13/64 shows lots of launch activity. 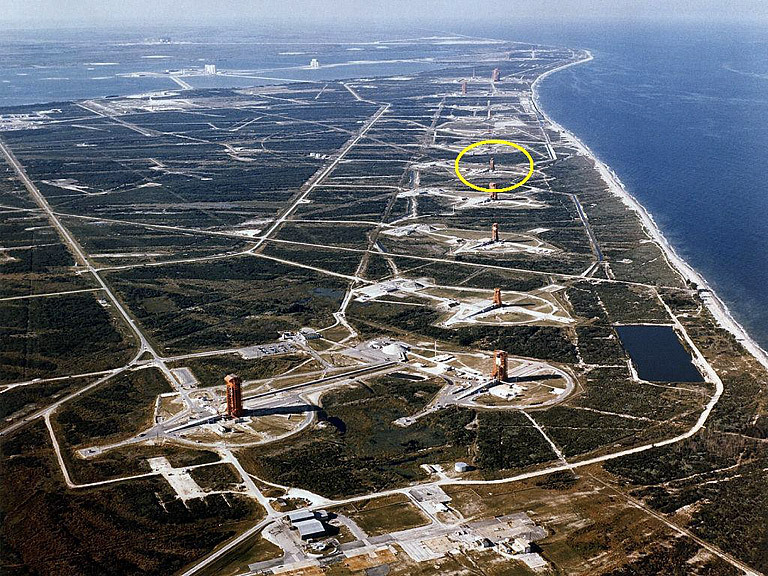 The yellow circle is pad 14, where the Mercury project started.